2014 is the year of the surprise re-birth of Shoegaze! I’m hardly the first person to notice this phenomenon, but be it the return of Slowdive, the continuing influence of My Bloody Valentine or one of the seemingly never ending stream of new bands aping the style, the jangling, reverb heavy sound is very much back…and that’s certainly no bad thing. Even at a festival as delightfully uninfluenced by the rise and fall of musical trends as Indietracks, one of the prevailing trends of the weekend was the merging of classic Indie-Pop with a shed load of late 80’s looking reverberation. The likes of Linda Guilala, Night Flowers and The Royal Landscaping Society, all seemed to have taken a good look at Loop, The Cocteau Twins and Ride and said you know what, I’d like a bit of that! It’s actually nothing new, the blurring of lines between the jangling C-86 and Shoe-gaze has been going on for a number of years now, via the likes of Veronica Falls and The Pains Of Being Pure At Heart. Some people have even entitled it ‘nu-gaze’, and it surely can’t be long before someone starts describing someone as post-shoegaze or even post-nu-gaze, which might just be the end of civilisation as we know it. For now though let us revel in just how good so much music sounds with a wall of reverb behind it! 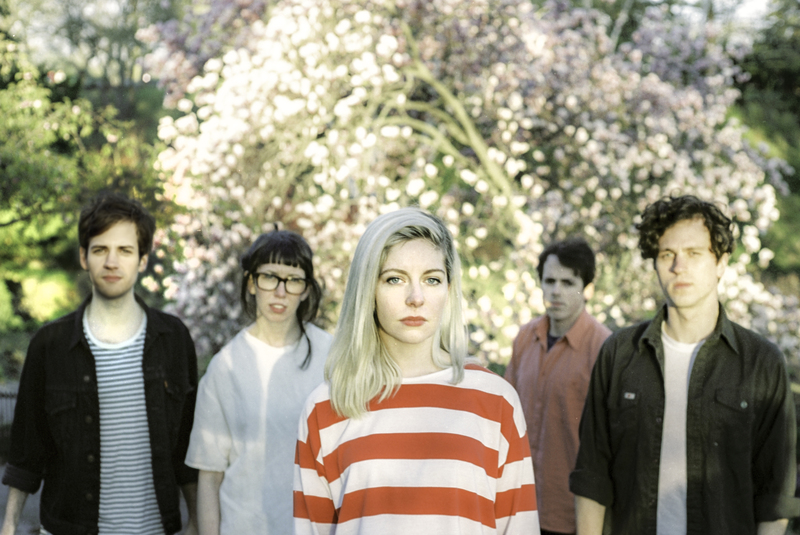 In certain corners of the world, Toronto five-piece Alvvays are currently just about the hippest band on the planet. They’re currently on a UK tour that seems to consist almost exclusively of East London’s trendiest venues and festivals. Visions Festival at the weekend, Birthdays in the heart of Dalston tonight, Rough Trade East tomorrow. We even heard their record being played in a Scandinavian themed coffee shop in Clapton; any band this appreciated by the capitals much loathed hipsters should by all accounts have no chance of breaking through on a bigger scale, but on this all-to brief set of tracks, there’s more than enough to suggest they can outlive the hype. The entire album clocks in at just over 30 minutes and if it never quite reaches the highs of that single, there are moments of joy throughout. Take opening track Adult Diversion. Lyrically, this sounds like a simple plea for attention, given a creepy stalker twist via the line “how can I get close to you, even if you don’t notice me as I admire you on the subway.” Molly’s lyrics throughout are a revelation, at times it almost feels as if you’re in a concept album, or perhaps a Hitchcock style thriller where she’s got poor Archie locked up in a loft somewhere, whilst she’s eyeing up wedding dresses and a top quality pad lock. Her singing too, is fantastic. Sometimes, as on the Veronica Falls like jangle pop of Atop a Cake and the aforementioned Adult Diversion, her words become almost gabbled as she rushes to keep up with the delightfully out of control music, guitars rushing ahead of themselves lurching like a run away mine cart. Indeed the line “is it a good time, or is it highly inappropriate?” on the opening track is so impossible to fit into the space provided that it’s forced into an almost Morrisseyish flamboyancy just to make sure it’s heard. If it’s not the most ambitious, varied or consistent of debuts, it’s entirely forgivable because the high points are simply brilliant. They show that even in a genre that seems so saturated, there’s always room for another brilliant pop song, and here they showcase some absolute belters. Thanks for your kind words, and superb knowledge of the band, very impressive! Love it, they sound brill! I’d add Cheatahs on to the list of new shoegaze-influenced bands. I’m loving them too! Saw Cheetahs play supporting Metz, never checked them out afterwards so will have to give them a proper listen! Alvvays really are great, definitely well worth a listen!